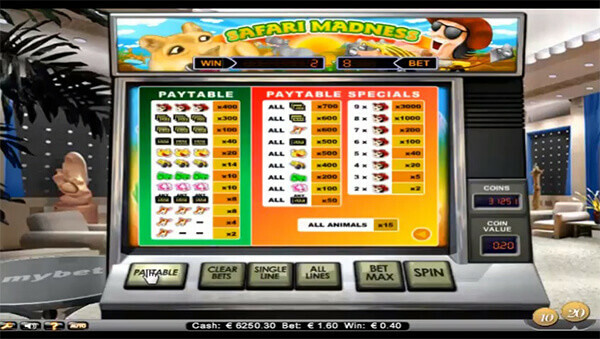 Safari Madness slot is not exactly what you might expect judging by the title. The title is justified only by the cartoony pictures of animals appearing on a 3×3 reel set. Otherwise, it looks more like casino madness. 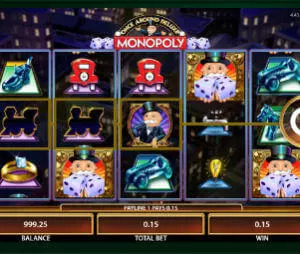 The setting shows the inside of a traditional casino while the fact that there are only 3 reels and 8 paylines also reminds of classic land-based fruit machines. Similar as with the super successful Mega Joker and Jackpot 6000, NetEnt delivers a classic slot design without any bonus game or special symbols but it does give a considerable boost to the paytable, so this slot might not be so naïve as it may seem at first sight. You won’t need too much money to hit the reels on Safari Madness. Actually, you can start off with as little as $0.10 per line going up to $6.40 per line. It is not exactly made for high rollers, but the payouts seem pretty tempting, though. The symbols appearing will be all kinds of jungle animals and it is the sole reason for the choice of the name for this slot. Apart from the wild animals: a tiger, a crocodile and a hippo you will also see a jeep, traditional BAR symbols and a head of a tourist which appears as the top-paying symbol. The layout features 3 reels and 3 rows with 8 paylines and the reels spin independently, which is why you have dedicated buttons below the reels to stop either one of them. The RTP of Safari Madness is 96.7%. Solid, but lower than what best NetEnt slots , such as the forth mentioned Joker and Jackpot 6000, and of course Blood Suckers have to offer. We cannot say that we are surprised to see that there are no Bonus features or special symbols, such as a Wild or a multiplier here. At the very first sight, it is clear that this slot is stripped down to the basics. However, NetEnt made sure to make this game worth your while by setting up a very generous paytable. The main prizes will come if you manage to fill all of the reels with matching symbols, so having that in mind everyone will be looking for the tourist’s face with sunglasses and a hat because 9 of these will return your stake 3,000 times. Triple BAR symbol should not be disregarded either, as the full screen of its kind brings a prize worth 700 times your stake. An interesting addition to the paytable is the prize of 15 times your stake if all of the reels get populated with animals. Let’s be honest about it. There is nothing mad or wild in this Safari Madness. If anything, the retro style of the theme might amuse you but this will only last a couple of spins. The only thing that can keep you in the game is the hope to see Tourist symbol across all reels and win the jackpot of 3,000 times your stake.